For information on starting and stopping productions, see Managing Ensemble. Note that for a live, live, deployed production, InterSystems recommends that you use the auto-start option, which is described in that book. 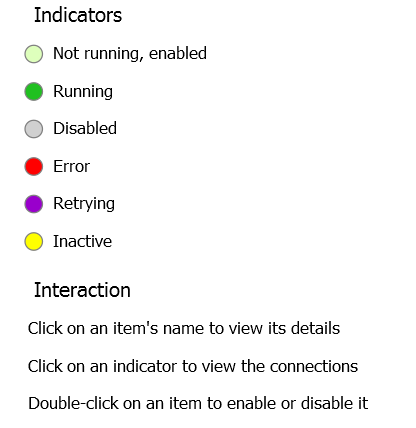 The Production Monitor page displays real-time status information about the currently running production in a condensed, one-page format, with links for further details. To display this page in the Management Portal, select Ensemble > Monitor > Production Monitor. 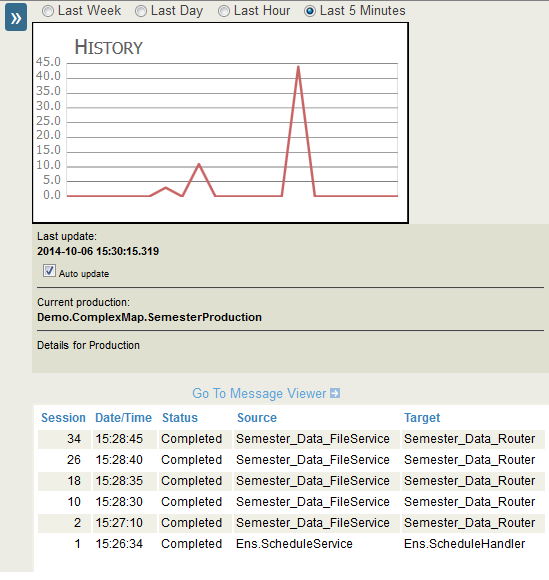 The Production Monitor page displays real-time information provided by the Monitor Service. The Monitor Service is a business service that is implicitly included in every Ensemble production (not visible as part of its configuration). The Monitor Service continually monitors the activities of Ensemble items while a production is running, and records data about them at frequent intervals. Queue Contents  Click to view the production queues. For information, see Monitoring Production Queues, later in this chapter. The Queues table (lower left) lists the status of Ensemble internal message queues and how many messages are currently waiting in each queue. See Adding Business Metrics to the Production Monitor, in Developing Ensemble Productions. The Queues page shows the current state of all the message queues being used by the running Ensemble production in the selected namespace. To display this page in the Management Portal, select Ensemble > Monitor > Queues. Priority  The priority of the message. See Message Priority in the first chapter. See Pool Size and Actor Pool Size in Configuring Ensemble Productions. If many queues have a consistently large buildup, there may be a general capacity issue on the host computer, the Ensemble production (in its role as a CSP application) may need more resources, or the underlying Caché installation may need to be tuned. 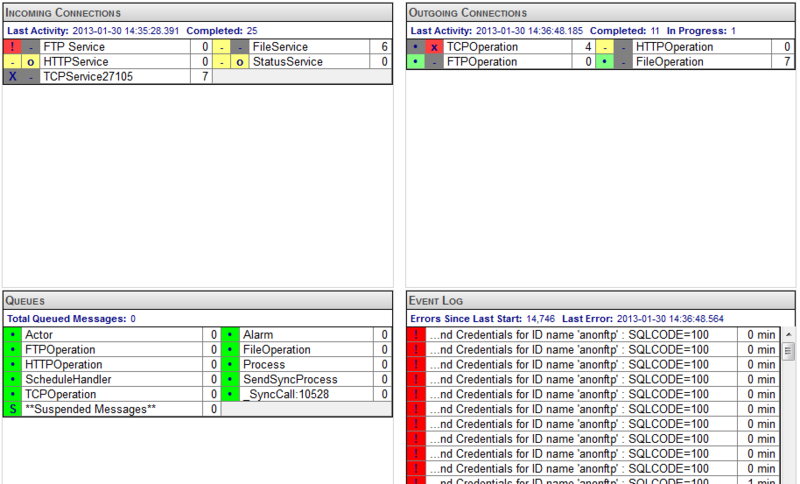 For suggestions, see the Caché System Administration Guide and Using Caché Server Pages (CSP). In general, however, you will be able to keep queues moving with the simpler adjustments listed in this topic. The Currently Active Jobs page shows the currently active jobs for the production in the selected namespace. To display this page in the Management Portal, select Ensemble > Monitor > Jobs. Jobs that are marked as dead are jobs that have been terminated for some reason and Ensemble has detected that the job is no longer present on the system. This is normally an indication of a serious problem and should not occur. Also, if Ensemble detects a dead job, it writes an error to the Event Log. Ensemble provides another way to view a production, the Production Configuration page. To access this page, select Ensemble > Configure > Production. Note that the primary purpose of this page is for configuring productions as described in Configuring Ensemble Productions. In some cases (usually during development), you might see the Update button on this page for a production that is Running. Click this, and Ensemble updates the production to resolve the discrepancy. For an explanation, see The Update Button in Configuring Ensemble Productions. Therefore, if a live, deployed Ensemble production goes into a Suspended state, contact the InterSystems Worldwide Response Center (WRC) for assistance. If a production becomes Suspended during development, see Correcting Production Problem States in Developing Ensemble Productions. In this case, you can use a procedure that discards the messages. A production acquires a status of Troubled if Ensemble is stopped but the production did not shut down properly. This can happen if you restarted Ensemble or rebooted the machine without first stopping the production. In this case, click the Recover button.